If you're like me and you can't resist a Bare Minerals Mystery Surprise Box, you may already know what you're getting, too. BARE ESCENTUALS Rock N Roll Eyeshadow Brush- This apparently is/was part of a kit from what I can tell. Concealer Broad Spectrum SPF 20 Summer Bisque- I'm not positive on this one either but if anyone got the regular bisque color and wants to swap for the Summer Bisque, I'd love to. bareMinerals Smoke & Define Double-Ended Eyeliner Trio- From QVC, the trio includes 3 dual-ended kohl and liquid eyeliners in Charcoal/Black, Sage/Black and Jet Black/Teal. Pop of Passion™ Lip Oil-Balm in Pink Passion (deluxe sample)- Youthful pink. This decadent lip oil-balm hydrates, nourishes and delivers luscious color that looks as good as it feels. Bare Escentuals bareMinerals Illuminating Mineral Veil® Finishing Powder (Mini)- Possibly in a silver case? Not positive on this one. Marvelous Moxie™ Lipgloss in Risk Taker- Chocolate shimmer. Luscious, vibrant color loaded into a refreshing formula that slips on satiny-smooth for sheer-to-medium coverage with nonstop glistening shine. Bare Escentuals Big & Bright Eyeliner - Midnight-Visually enhances the whites of eyes, so eyes look whiter and brighter. Infused with a blend of 100% pure bareMinerals, conditioning botanical extracts and antioxidants. Soft smudge tip and sharpener . Marvelous Moxie™ Lipstick in Raise the Bar (mini)-Creamy, super-saturated, ultra-pigmented color glides on like butter for full coverage in a rich satin finish. Plus the branded travel bag. Well, that's a crapton of eyeliners. Ugh. I love getting lipstick but no eyeshadow at all!? /cry. Of course I'll know more about how I feel when it arrives. Did you get the same things? It's a good deal for $30 but woo... eyeliners galore. 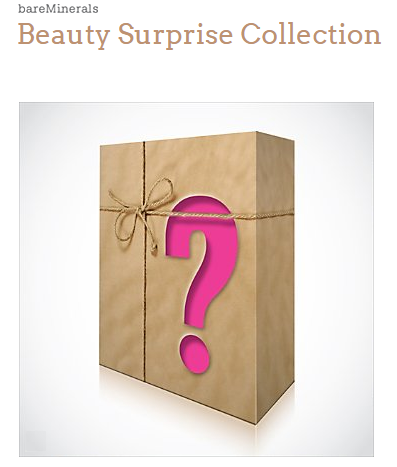 I'm still waiting to be impressed by a beauty surprise. Each one seems to be heavy on something - the one I got before was really primer heavy, sometimes they're shadow heavy, and now this one's eyeliner heavy. If I got this one I'd totally swap for the summer bisque concealer. It's a perfect match for me! I got some different things. I did get a blush/bronzer combo and a lumenizer duo. I think I've seen two different versions so far. I'm glad you got something better than eyeliner!! Thanks so much for the links!!! I was really struggling to figure them out. I ordered it in the hopes of getting eyeshadow, too. This is liner heavy and I would also say a bit lip heavy. I haven't gotten mine yet but I also ordered in the hope of getting some sort of eye shadow. I would really like to get some new eyeshadow. I don't really use eye liners too quickly either but in my order, I also got my birthday gift...which was a black eyeliner. I also got eye liner from urban decay for my birthday gift and there was a sample of eye liner that came with my order. BUT WAIT there's more, my aunt bought me a lancome gel eye liner for my birthday. I'm like set on eye liner for quite some time...Hahahahaha. Maybe I'll give one to my sister who told me that she is in desperate need of eye liner. My mystery box actually one came with 3 liners. There was not a 3 pack of liners like you had put up in the link for the teal/black liner. Same. They must have broken up all the extra packs. I'm kinda glad because that's a LOT of liners. I'm glad you mentioned it because I was wondering if I just was missing two. I'm glad I got the teal, though. :D Better than plain old black. Looks like they only meant for it to be one. I wonder if other people got the Rose Gold. I think the Rose Gold may have been referring to the writing on the liner.The color of the words on the liner are in rose gold. But yeah, overall I wish that I would have gotten an eye shadow instead of 3 lip colors. Me, too! Did your Pop oil balm smell funny? Maybe a little. I definitely didn't like it. I wiped it off after I put it on.